Came from them, as the spirits wailed their doom. Hardly a more despairing description of hell could be imagined than that of Dante’s inferno, written in Italy in 1307. 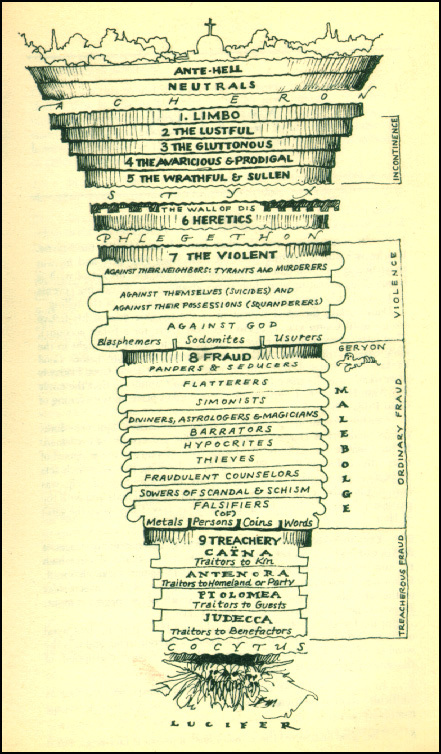 Dante’s hell consists of nine levels each designed to bring recompense appropriate to particular sins. Drawing on the apocryphal Apocalypse of Peter, Dante’s work fired the imagination of the middle aged religious world with never-before-heard descriptions of the torment of the damned. So, what of the doctrine of hell? Will hell be anywhere similar to Dante’s imagination of it? Does the Bible teach a literal hell with eternal torment, or is the idea of hell a fiction produced by the overzealous imagination of the medieval church? What does the Bible teach about hell? If the Bible teaches such a place of eternal torment, would not this make God a cruel monster, punishing people far in excess of their crimes? These are some of the questions we hope to answer today. Why is it important to study the doctrine of hell? The doctrine of hell has direct bearing on the nature of God, especially his love and justice. Will God punish sin? Is He just? Will people “get away with murder”? But how can a loving God send anyone to hell? Why not rather never create them in the first place? The doctrine relates to the nature of man. When we see sin as rebellion and hatred of God and that it deserves the utmost of punishments, we will abhor it all the more. The doctrine of hell has been a major motivation for evangelism. A clear understanding of what the Bible teaches about Hell will help us to give a clear warning about the consequences of not accepting the gospel. The doctrine gives us greater appreciation for our salvation. Our appreciation of God’s gift of grace and its immense value is much enhanced as we fully comprehend what we have been saved from. 1) Universalism — Universalism believes that through the atonement of Jesus, God will ultimately reconcile all men to himself regardless of whether they have believed in Jesus during their lifetime. Universalists believe that eternal punishment in hell is a false doctrine. There are two main camps within Christian Universalism. One camp believes that, after death, people will be punished in hell for a period of time and in ways appropriate to their sins. The other camp believes that punishment for sins occurs solely in this life. 2) Annihilationism — After a period of punishment for their sins, the unredeemed will be annihilated and will cease to exist forever. God will condemn them to extinction, which is the second death. Annihilationists have two views concerning the eternal nature of mankind. Those who believe in what is called “conditional immortality” deny that man is inherently immortal in nature. Only the righteous are granted the gift of eternal life and the wicked die a second death and cease to exist. Others— true annihilationists—believe that man is eternal in nature but that God, in His power, can still destroy them so that they no longer exist. Jehovah’s Witnesses, Herbert Armstrong’s Worldwide Church of God, the Mormons, Christian Science and Seventh-day Adventists all hold to some form of annihilationist teaching. Today, a growing number of individuals who have been regarded as within the evangelical camp are adopting various annihilationist scenarios. Most notable among them are John R. W. Stott and Clark Pinnock. 3) Eternal suffering — The unredeemed will be resurrected to eternal suffering and punishment in hell. Indeed, there is evidence that, through the ages, the church’s thinking in regard to hell has been significantly influenced by extra-biblical material, especially the Apocalypse of Peter. For a time, this apocalypse, supposedly written by Peter, enjoyed fairly wide acceptance within certain parts of the church as an authentic revelation of God. Here is a summary from the web site http://www.ntcanon.org/Apocalypse_of_Peter.shtml. “The Apocalypse of Peter is best known for its lurid descriptions of the punishments of hell. It is as outstanding an ancient example of that type of writing by means of which the pictorial ideas of Heaven and Hell were taken over into the Christian Church. In contrast to the Revelation of John which displays the final struggle and triumph of Jesus Christ, its interest no longer lies on the person of the Redeemer, but on the situation in the after-life, on the description of different classes of sinner, on the punishment of the evil and the salvation of the righteous. If the Apocalypse of Peter as a book lost its meaning in time, the ideas represented in it lived on in various ways — Sybyllines II; Apocalypse of Paul; apocalypsis seu visio Mariae virginis; right up to the full tide of description in Dante’s Divina Commedia. What does the scripture teach about the destination of the wicked? The Old Testament says little about punishment of the wicked after death, referring primarily to the punishment they receive in this life. The word “hell” appears 31 times in the King James translation of the Old Testament as a translation of the Hebrew word “Sheol.” However this Hebrew word has the meaning “the underworld” or “the place of the dead,” and is always translated “Sheol,” “grave” or “the realm of the dead in the NIV and NASB. This verse teaches a resurrection of both the righteous and the wicked and that the wicked will suffer shame and everlasting contempt. Although eternal punishment is not specifically stated, it may be implied by the fact that the wicked will be resurrected and by the phrase “everlasting contempt.” The word “contempt” comes from a root that means “to repulse” and means “aversion, abhorrence. The word is used only in Daniel 12:2 and Isaiah 66:24. This verse is quoted by Jesus in Mark 9:48 and may refer to unending fire and destruction in hell. In context the word “they” refers back to “all mankind” in verse 23, who will be bowing down to the Lord week after week and month after month as long as the “new heavens and new earth …endure.” This might imply that their looking upon the dead bodies of those God has judged could also continue forever. On the other hand, this verse may simply be stating that nothing will be able to stop the worms from eating their dead bodies or the fire from consuming them. This verse is sometimes thought to refer to the everlasting fires of hell yet, in context, it appears to figuratively refer to God’s judgment on the wicked in Judea through the conquering Assyrian armies. 2) All sin will be justly punished. God will punish people in accordance with the severity of their sin and the amount of light they have received. God’s judgment will be in accordance with the evil deeds that men have done. (Colossians 3:25 NIV) Anyone who does wrong will be repaid for his wrong, and there is no favoritism. Those in Tyre and Sidon were far from God and from righteousness and were strangers to His covenants of promise. The people of Sodom, because of the utter depravity of their sin, were legendary examples of those who deserved the judgment of God. Yet Jesus states that the outwardly righteous Jews who heard Him and refused to repent would be judged more severely on the Day of Judgment than either of these. The Jews in Jesus’ day had so much light and so much evidence for the coming of the Messiah that their sin of rejecting Him outweighed even the sin of Sodom and would be judged more severely. (Luke 12:47-48 NIV) That servant who knows his master’s will and does not get ready or does not do what his master wants will be beaten with many blows. But the one who does not know and does things deserving punishment will be beaten with few blows. From everyone who has been given much, much will be demanded; and from the one who has been entrusted with much, much more will be asked. Differences in the severity of punishment is clearly taught here and in the above passage. (John 5:28-29 NIV) Do not be amazed at this, for a time is coming when all who are in their graves will hear his voice and come out—those who have done good will rise to live, and those who have done evil will rise to be condemned. If annihilation were the ultimate penalty, why would the wicked be physically resurrected to be “condemned.” The fact that they will be resurrected would seem to imply that annihilation will not be their ultimate penalty. Many Annihilationists and Universalists do believe that the unrighteous will be resurrected and punished in hell, yet that punishment will not be eternal. 4) Unbelievers will perish and be destroyed. The words “perish” and “be destroyed” would seem to state that they cease to exist. Does this teach that the unrighteous will be annihilated? Here perishing is contrasted to eternal life. If “eternal life” means to live forever, “perish” would seem to mean cease to exist. In this passage, the destruction of the soul parallels the destruction of the body. The body decomposes and ceases to exist, why not the soul? The Greek word “ἀπόληται,” translated “perish in John 3:16 and “destroy” in Matthew 10:28 can have the meanings of “ruin” or “lose” as well as the more prevalent meaning of “destroy” and “destroy utterly.” Examples of this are: Luke 5:37, where the wineskins are “ruined” (NIV); Luke 15:4, where the shepherd “loses” (NIV) a sheep; John 6:27, where food “spoils” (NIV); and where those who serve will not “lose’ (NIV) a reward. It is not adequate, however to show that a word can have a certain meaning. We must show that in actually has that meaning in this particular context. In John 3:16 and Matthew 10:28, the NIV translation of “perish” and “destroy” seem to be the appropriate translations for their contexts. Yet, even translated this way, the words “perish” and “destroy” may not require the meaning of annihilation, but could mean utter ruin. Jesus says that many of the “subjects of the kingdom” (Jews) will be excluded from the kingdom they are longing for. This exclusion from God and from what is good and from what they thought would be their inheritance will be an incredible source of grief and remorse and anger, so much so that they will weep and gnash their teeth. 2 Thessalonians 1:5-10 (NIV)All this is evidence that God’s judgment is right, and as a result you will be counted worthy of the kingdom of God, for which you are suffering. 6 God is just: He will pay back trouble to those who trouble you 7 and give relief to you who are troubled, and to us as well. This will happen when the Lord Jesus is revealed from heaven in blazing fire with his powerful angels. 8 He will punish those who do not know God and do not obey the gospel of our Lord Jesus. 9 They will be punished with everlasting destruction and shut out from the presence of the Lord and from the majesty of his power 10 on the day he comes to be glorified in his holy people and to be marveled at among all those who have believed. Those who partake of the pain of persecution and the hatred of opponents to the gospel can perhaps better understand the judgment of God. Those who persecute the godly are worthy of judgment and those who patiently endure in faith are worthy of the reward of the kingdom of God. When Christ returns, He will punish those who do not know God or obey the gospel. Their punishment will be everlasting destruction and banishment from the Lord’s presence and power. These verses seem to imply a sense of justice. These people hated God and persecuted His people. They wanted nothing to do with God, the gospel, or righteousness. In a sense, he gives them what they wanted—separation from His presence. 6) Hypocritical unbelievers will be condemned to blackest darkness. Jude 13 (NIV)They are wild waves of the sea, foaming up their shame; wandering stars, for whom blackest darkness has been reserved forever. 2 Peter 2:17 (NIV)These men are springs without water and mists driven by a storm. Blackest darkness is reserved for them. These two verses are talking about unbelievers who infiltrate the church and take advantage of believers for their own selfish gain or pleasure. Yet the idea of “blackest darkness” may very well equally apply to the fate of all unbelievers. 7) The wicked will be thrown into fire and into a fiery furnace. Fire normally consumes. Wouldn’t John the Baptist’s statement have communicated the idea of annihilation to his hearers? And the verse says that the chaff will be burned up, not burned perpetually. Matthew 13:40-42 (NIV) As the weeds are pulled up and burned in the fire, so it will be at the end of the age. The Son of Man will send out his angels, and they will weed out of his kingdom everything that causes sin and all who do evil. They will throw them into the fiery furnace, where there will be weeping and gnashing of teeth. Matthew 5:22 (NIV) But I tell you that anyone who is angry with his brother will be subject to judgment. Again, anyone who says to his brother, ‘Raca,’ is answerable to the Sanhedrin. But anyone who says, ‘You fool!’ will be in danger of the fire of hell. The judgment of sin involves the fire of “hell.” But what is the fire of hell? Is it eternal suffering or annihilation? The words translated “fire of hell” in the NIV are literally, “Gehenna of fire.” What does “Gehenna” refer to? So, the question is, what did the term “Gehenna” mean in the minds of the hearers? Did it signify to them the actual valley outside Jerusalem that was their garbage dump? If so, it would not necessarily carry with it the concept of eternal punishment, but could indicate simply destruction or death. One question that relates to this would be, “What did the Jews who were listening to Jesus believe about punishment after death?” Jesus would certainly have had an understanding of his hearers’ concepts of punishment in the afterlife and would have addressed his comments with this common understanding. If Josephus’ discourse is indeed authentic and an accurate understanding of the Pharisees’ view of Hades and subsequent eternal judgment of the wicked, this would seem to settle any question concerning the meaning “Gehenna” and “eternal fire” as used by Jesus. He would have understood their theology and spoke in view of their point of reference. One principle of interpretation is to try to put yourself in the place of the listener. If the listeners had Josephus’ understanding of punishment in hell, they certainly would have understood Jesus’ words about Gehenna to refer to the eternal suffering that they already believed in. The book of Maccabees is another source that confirms that many Jews of Jesus’ time believed that the wicked would suffer eternal torment by fire. The books of Maccabees, were written in the inter-testimental period. Although not inspired, they do give valuable insight and background into first century Jewish thought and life, including their view of eternal punishment. 4 Maccabees 12:12 (RSV)Because of this, justice has laid up for you intense and eternal fire and tortures, and these throughout all time will never let you go. 4 Maccabees 13:15 (RSV)for great is the struggle of the soul and the danger of eternal torment lying before those who transgress the commandment of God. Luke 12:4-5 (NIV) “I tell you, my friends, do not be afraid of those who kill the body and after that can do no more. But I will show you whom you should fear: Fear him who, after the killing of the body, has power to throw you into hell. Yes, I tell you, fear him. 8) Unrepentant unbelievers will be tormented forever. It is not enough to show that a word can have an alternate meaning. It must be shown that the word has this alternate meaning in the context that it is used. In Matthew 25:46 the duration of the punishment of the wicked forms a parallel with the duration of the life of the righteous: aijwvnio” is used to describe the length of both. We cannot limit the duration of the punishment of the wicked without limiting the duration of the life of the righteous. But there are many verses that confirm that the phrase “eternal life” does indeed refer to life forever and ever. Revelation 19:20 (NIV) But the beast was captured, and with him the false prophet who had performed the miraculous signs on his behalf. With these signs he had deluded those who had received the mark of the beast and worshiped his image. The two of them were thrown alive into the fiery lake of burning sulfur. The beast or antichrist, a future king who will reign over the whole earth in the end times, and his false prophet will be thrown alive into the lake of fire immediately after Christ’s return to earth. Revelation 20:10 (NIV)And the devil, who deceived them, was thrown into the lake of burning sulfur, where the beast and the false prophet had been thrown. They will be tormented day and night for ever and ever. The devil will be thrown into the lake of burning sulfur a thousand years after the return of Christ. At that time, the beast and false prophet will have been in the lake of fire for 1000 years. These two men and this fallen angel will be tormented day and night forever and ever. It is not only the devil who will be tormented, but these two men as well. Here we see the final dwelling place of the devil. It is the place Jesus referred to in Matthew 25: 41 as “the eternal fire prepared for the devil and his angels.” Those who will be separated as “goats” will be cast there. The fate of wicked men will be the same as that of their leader, which is eternal torment in a lake of fire. Revelation 20:11-15 (NIV)Then I saw a great white throne and him who was seated on it. Earth and sky fled from his presence, and there was no place for them. And I saw the dead, great and small, standing before the throne, and books were opened. Another book was opened, which is the book of life. The dead were judged according to what they had done as recorded in the books. The sea gave up the dead that were in it, and death and Hades gave up the dead that were in them, and each person was judged according to what he had done. Then death and Hades were thrown into the lake of fire. The lake of fire is the second death. If anyone’s name was not found written in the book of life, he was thrown into the lake of fire. On the final judgment day, all men will appear before the great white thrown of God and be judged. Those whose names are not written in the book of life will be thrown into the lake of fire. Death and Hades will also be thrown into the lake of fire. This would seem to be referring to the destruction and annihilation death and Hades. Some have argued that since death and Hades are evidently destroyed by the fire, so will those who are thrown into it. Yet we have seen that this is not so, but that at least three individuals will be tormented there forever and ever. Here an angel warns those who live on the earth of judgment that will come upon them if they worship the beast (antichrist), they will be tormented with burning sulfur and have no rest day or night. The smoke of their torment rises forever and ever. Again we see the term “through the ages of the ages,” probably the strongest term for “forever” used in the New Testament. Smoke comes from somewhere. Here it apparently comes from the burning sulfur that is causing their torment. The fact that the smoke of their torment rises forever and ever means that the torment goes on forever and ever. There have been many valiant efforts to soften or explain away the Scripture’s terrifying depiction of hell as a place of eternal torment, but they all ultimately come up short. When referring to Gehenna, Jesus did mean more than the physical valley outside Jerusalem. He spoke of a place of suffering to which God would cast the wicked after they were dead. Many if not most of the Jews of Jesus’ day believed in eternal torment for the wicked. Certainly they would have interpreted Jesus’ words about “Gehenna,” “eternal fire” and “eternal torment” according to their understanding. Jesus uses these terms without any effort to correct their understanding. Jesus, Himself, talks the most and the most clearly about Hell, regularly warning his hearers and admonishing them to do absolutely anything possible to avoid it. The book of Revelation speaks very clearly about the eternal torment of the ungodly forever and ever. Those who have not been forgiven of their sins will indeed suffer eternally in a hell from which there is no escape. God’s wrath will remain upon them forever. They will suffer in agony in flames of burning sulfur, yet never be consumed. They will be cut off from God and banished from all the good that He is and that He gives. They will dwell in darkness, possibly isolated from everyone else in eternal loneliness and regret. Is it immoral of God to inflict everlasting punishment on His creatures? In answer to this, we must note that the seriousness of a crime is not necessarily related to the time it takes to commit it. The argument that “sins committed in time cannot be worthy of eternal suffering” is incorrect. Some crimes, such as murder, may take only a moment to commit, whereas it may take a thief hours to load up a moving van with someone’s possessions. Yet, murder is a far more serious crime than theft. Secondly the nature of the object against which the crime is committed must be taken into account. Stealing in general is a crime, but stealing from your mother is even more despicable because you owe special allegiance to your parents. Torturing an animal is a crime, but torturing a human being is an even greater crime, worthy of greater punishment. The criminal act is the same in each case (i.e., stealing and torture), as is the person committing the act. But the different worth and dignity of the objects against whom the offenses were committed makes the difference in the gravity of the two offenses. How much more serious, then, is even the slightest offense against an absolutely holy God, who is worthy of our complete and perpetual allegiance? Sin against an absolutely holy God is absolutely serious. For this reason, the unredeemed suffer absolute, unending alienation from God; this alienation is the essence of hell. It is the annihilationists’ theory that is morally flawed. Their God is not truly holy, for he does not demand that sin receive its due. Those who have an emotional problem with Hell have not understood the true magnitude of our offense against almighty God. If we could truly see sin as God does, we would not have the slightest problem with the doctrine. Rather, we would find ourselves distraught if God did not punish sin for all eternity. Advocates from church history: Justin Martyr and Theophilus of Antioch (proto-conditionalists), Arnobius, John Biddle, William Whiston, Henry Constable, and Edward White. Advocates from church history: Tertullian, Lactantius, Basil of Caesarea, Jerome, Cyril of Jerusalem, Chrysostom, Augustine, Aquinas, Luther, Calvin, Edwards, Whitefield and Wesley. The Destruction of the Finally Impenitent,” Criswell Theological Review 4, no. 2 (Spring 1990):246-47, 253. David L. Edwards and John R. W. Stott, Evangelical Essentials: A Liberal-Evangelical Dialogue (Downers Grove: InterVarsity, 1988), 318.